In total, this year the key rate was reduced by 5.5 percentage points from 17% and has almost returned to the levels of late autumn of 2014. 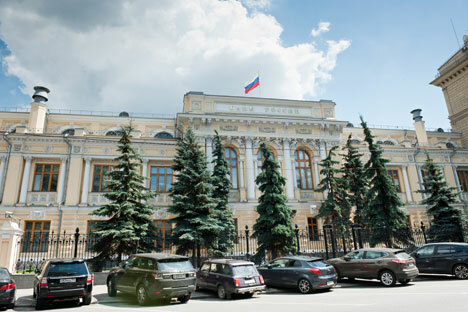 The Russian Central Bank Board of Directors for the fourth consecutive time reduced the key rate - the weekly repo rate - which determines interest rates for all loans in the economy. The key rate was reduced by 1 percentage point - from 12.5% to 11.5%, according to the press release of the Russian Central Bank published Monday. Remaining risks of the economic downturn with smaller inflation risks is the main reason for the Central Bank to reduce the key rate. According to the Central Bank, after reaching its peak in March, the annual inflation rate dropped to 16.4% in April and 15.8% in May. According to the Central Bank, as of June 8, the annual growth rate of consumer prices was 15.6%. "The slowdown in the growth of consumer prices was largely due to a decline in consumer demand amid a significant reduction in real incomes, as well as strengthening of the ruble in February and May. In addition, the process of adjusting prices to the established in August, 2014 foreign trade restrictions has finished, and this factor does not provide additional inflationary pressure," the Central Bank said. The Central Bank noted that the dynamics of main macroeconomic indicators in Russia point to further cooling of economic activity. "Although structural factors continue to have a dampening effect on economic growth, the current decline in output is, among other things, of cyclical nature," the press release said. The experts, interviewed by TASS, anticipated the Central Bank’s decision. Nine experts (from VTB Capital, Sberbank, Deutsche bank, Gazprombank, Metallinvestbank, Raiffeisenbank, BCS, Renaissance Capital and Alfa Bank) believed that the rate will be reduced by 1 percentage point to 11.5%, three more (Credit Suisse, IDF Kapital and Uralsib Capital) said the rate will be reduced by 0.5 percentage points to 12%, two (HSBC Bank and ING) predicted the rate at 11%, another analyst at Nordea expected to see key rate at 11.75%. According to them, the decision of the Central Bank will be based on the need to further support economic growth; at the same time the risks of a new devaluation limit the appetite of the Central Bank to reduce rates. The next meeting of the Board of Directors of the Russian Central Bank, which will determine the level of the key rate, will be held on July 31.